This is my first baby carrot, pictured with a Haviana for size purposes. 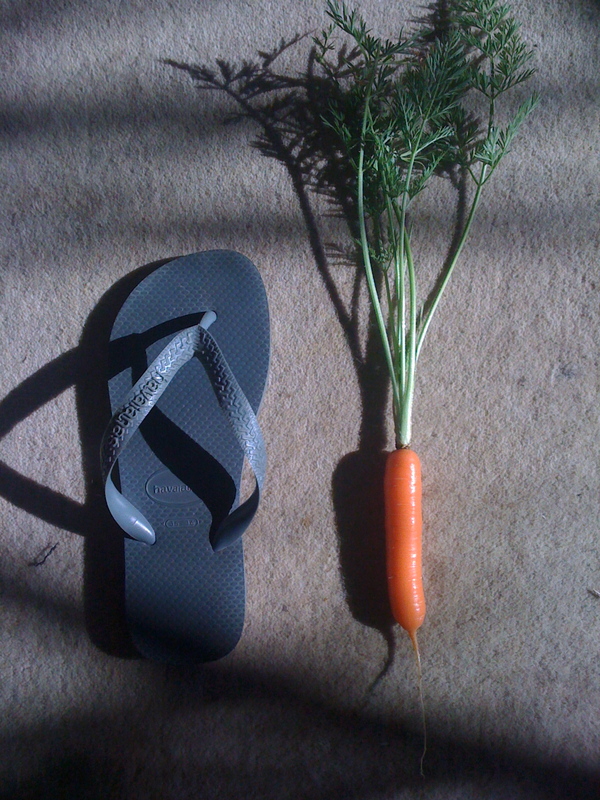 I couldn't be prouder if I'd grown it myself... oh but wait, I did! It's brothers and sisters are still happily growing away, but I got impatient when I saw this one poking it's orange head above the soil and pulled it out. I think I'll wait until the others get bigger because while it was tasty, there wasn't much to taste. I included it into a simple pasta dish, served with a red wine sauce chock full of veggies. I can't wait for the weather to be right to grow some more fresh produce. At the moment I have carrots, garlic, mint, parsley, rosemary, spring onions, leek, pineapple and chilli growing. I'd love to add some beans, tomatoes and other delicious spring time foods. I've also got a compost bin on the go, so that ought to add some nutrients when required!